Chipotle Mexican Grill Inc. (CMG.N) soared to the highest in more than three years on Thursday after the chain handily beat earnings, sales, and margin expectations in the fourth quarter as traffic turned positive, rising 2 per cent. Efforts to boost the business have paid off through the use of expanded delivery, digital capabilities and a new loyalty program that have reclaimed customers after a series of food-borne illness scares. In the past 12 months, Chipotle shares have climbed 117 per cent. But even with the improved results, analysts stuck to their ratings, providing commentary that supported their existing buy, hold, or sell positions. 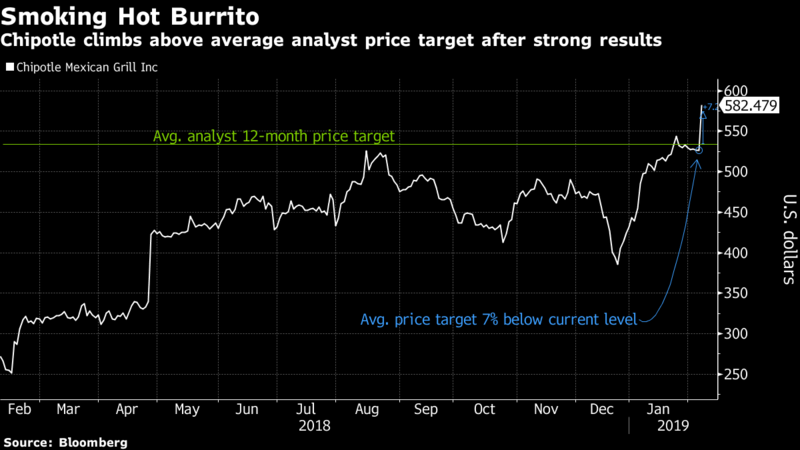 But the average 12-month price target for Chipotle has increased to US$534 per share from US$494 just a week ago, according to Bloomberg data. Rates overweight, while acknowledging that CMG is an expensive stock and “a lot still has to go right to achieve this bull case.” Price target to US$617 from US$600. “With the exception of menu price, we expect the drivers of 4Q18 SSS to build in ’19, including new marketing, digital sales and operations (throughput), potentially driving upside” to the initial mid-single digit same-store sales growth forecast.